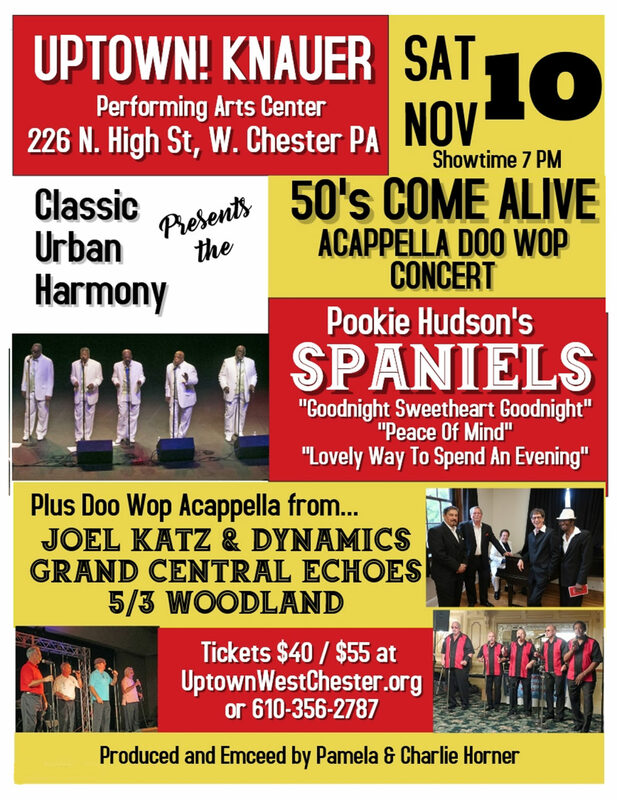 Pookie Hudson’s Spaniels to replace Wizards on our November 10, West Chester. PA, concert. The Wizards are no more, replaced on our West Chester PA concert with Pookie Hudson’s Spaniels. In the 37 years since their first recording, no one has come closer to getting the Wizards to perform live that we did. We even sat in on one of their rehearsals, becoming the only 2 outsiders ever to watch them sing. Unfortunately, members of the Wizards came to realize they could not reach the level of perfection of their glory days with the time remaining. So, they’ve decided to forever close this chapter of their music careers. In memory of the group, Joel Katz, the Wizards’ lead, will sing their “50’s Come Alive” during his acappella set with his new group, the Dynamics. In place of the Wizards, we’ve selected one of the most outstanding vocal groups around, Pookie Hudson’s Spaniels. This is the Spaniels group that the late Pookie Hudson trained and had back him for the last 10 years of his life. Those of you who were at Doo Wop Explosion 2 don’t have to be told how great this group is. They’ll be singing your favorite Spaniels songs like “Goodnight Sweetheart Goodnight,” “Peace Of Mind,” “Heart & Soul,” Lovely Way To Spend An Evening,” “Trees” and “People Will Say We’re In Love”. AND, they’ll be singing them ACAPPELLA. On top of this, you’ll see Grand Central Echoes singing Paragons and Jesters songs with their great lead, former Paragons’ Perry Martin, plus the Voice of New Jersey Doo Wop, Joel Katz with his Dynamics and one of the most entertaining groups around, 5/3 Woodland. And they’ll all be singing acappella. Tickets are available now at www.UptownWestChester.org or by calling the Box Office at 610-356-2787. .